Health starts in our homes, schools, workplaces, neighborhoods, and communities. People with a quality education, stable employment, safe homes and neighborhoods, and access to preventive services tend to be healthier throughout their lives. 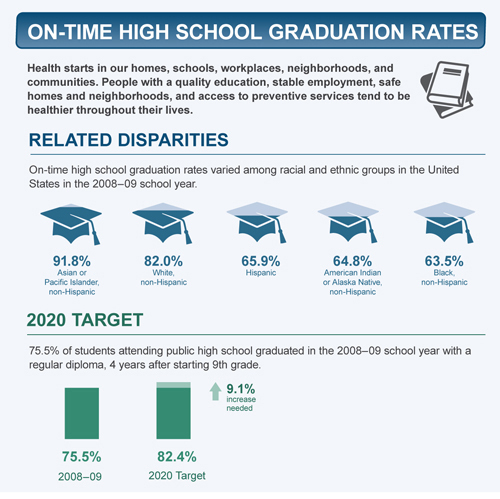 On-time high school graduation rates varied among racial and ethnic groups in the United States in the 2008–09 school year. 75.5% of students attending public high school graduated in the 2008–09 school year with a regular diploma, 4 years after starting 9th grade.